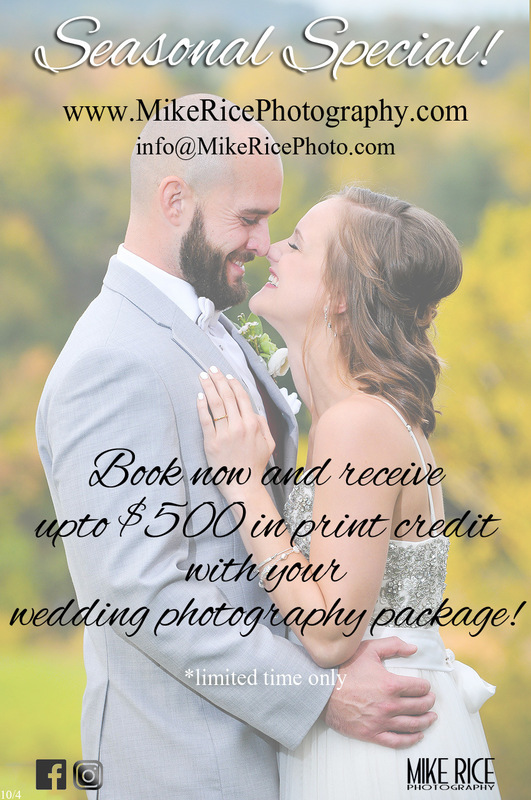 Want to do more with the amazing photographs that you will get from Mike Rice Photography!?! We are currently running a special on our Gold and Silver packages that will provide you with the great opportunity to to receive actual prints with your packages! Perfect to add to 'Thank-you' cards, wedding announcements and photo albums. Offering a wide variety of print sizes from wallets all the way up to 24"x36" and even larger! There is a print size for everyone! Looking for something a bit different other then a framed print? We also offer large canvas wall art! Receive a $500 print credit when you book the 8 hour Gold collection, or a $250 print credit with the 4 hour Silver Collection. This is a limited time special so be sure to book your date today!